In September 1940 the Howells’s house in Barnes was bombed in the Blitz with the loss of his library and many manuscripts. The family moved temporarily to Cheltenham and Howells was given a bed in the basement of the RCM on teaching days. New Year 1941 saw the family snowed in. Remarkably, Howells produced a new work every single day until 15 January when he had to return to London. This burst of activity included the composition of a set of anthems which he called In Time of War. O pray for the peace of Jerusalem was written on the 5th, the missing Ponder my words followed the next day and Like as the hart was written in a single sitting on the 7th. Great is the Lord, Let God arise, and We have heard with our ears followed. The music of O pray for the peace of Jerusalem barely raises its voice and is a gentle meditation on the word ‘peace’. En septembre 1940, Howells perdit sa bibliothèque et aussi de nombreux manuscrits dans le bombardement de sa maison, à Barnes, pendant le Blitz. La famille s’installa provisoirement à Cheltenham et Howells reçut un lit au sous-sol du RCM, pour les jours où il enseignait. Au Nouvel An de 1941, la famille fut bloquée par la neige et Howells produisit, ce qui est remar­quable, une œuvre par jour jusqu’au 15 janvier, date à laquelle il dut rentrer à Londres. Cette poussée d’activité inclut une série d’anthems que le compositeur intitula In Time of War. O pray for the peace of Jerusalem fut écrit le 5 janvier, Ponder my words (manquant) le lendemain et Like as the hart le surlendemain, d’une traite. Vinrent ensuite Great is the Lord, Let God arise et We have heard with our ears. La musique de O pray for the peace of Jerusalem, presque monocorde, est une douce méditation sur le mot «peace» («paix»). Während des Blitzkrieges im September 1940 fiel Howells’ Haus in Barnes einem Bombenangriff zum Opfer, bei dem auch die Bibliothek und viele Manuskripte zerstört wurden. Die Familie zog vorübergehend nach Cheltenham, und für Howells’ Unterrichtstage in London wurde ihm ein Bett im Keller des Royal College of Music zur Verfügung gestellt. Zum Neujahr 1941 war die Familie eingeschneit. Bemerkenswerterweise schrieb Howells bis zum 15. Januar, als er wieder nach London fahren musste, jeden einzelnen Tag ein neues Werk. In diesem Schaffensrausch entstand auch eine Sammlung von Anthems, die Howells In Time of War bezeichnete. O pray for the peace of Jerusalem wurde am 5. Januar geschrieben, das nunmehr verschollene Ponder my words folgte am Tag darauf. Like as the hart komponierte Howells ohne Unterbrechung am 7. Januar. Great is the Lord, Let God arise und We have heard with our ears folgten später. Die Musik für O pray for the peace of Jerusalem ist kaum hörbar und liefert eine sanfte Meditation über das Wort „peace“ („Frieden“). O pray for the peace of Jerusalem. They shall prosper that love thee. 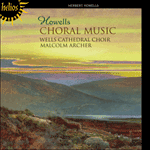 It has been written of Herbert Norman Howells (1892–1983) that he is ‘more widely respected than performed’. Whilst this may sadly be the case with respect to his orchestral and chamber music, it is certainly not true of his organ and choral music. Howells was articled to Herbert Brewer at Gloucester Cathedral in 1905. In 1912 he won an open scholarship to the Royal College of Music where he studied with Stanford and Wood. Howells was to return to the Royal College as a teacher from 1920 and became almost as well known in that capacity and as an examiner and adjudicator as he was as a composer. He succeeded Gustav Holst in 1936 as Director of Music at St Paul’s School in Hammersmith, a post he retained until 1962. In 1950 he was appointed King Edward VII Professor of Music at London University. 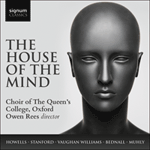 Amongst Howells’s self-confessed influences were plainsong, the modes, the pentatonic scale, folk-song, his friendship with Ralph Vaughan Williams and a feeling of oneness with the Tudor period. Howells’s music is frequently contrasted with that of his contemporaries, Boughton, Bridge, Delius, Gurney, Holst and Vaughan Williams; the young composer was particularly influenced by the first performance in 1910 of Vaughan Williams’s Fantasia on a theme of Thomas Tallis, which took place in Gloucester Cathedral. Comparisons to Howells’s contemporaries are often unfair and laboured; there are many of Howells’s contemporaries whose music has been strongly affected by some or all of the influences that prevailed upon him. 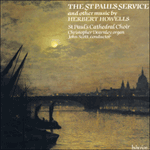 In reality Howells is not a pastiche composer of the twentieth century, but rather a testament to the fruits of the Second English Renaissance, and a fine composer in his own right. The anthem O pray for the peace of Jerusalem was completed on 5 January 1941 whilst the composer was in Cheltenham and is the first in a set of four short anthems. 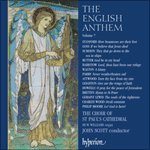 This work demonstrates the composer’s ability to build up seamlessly to a climax and then to release the tension and allow the music to slip away into the stillness of a great cathedral. This arch form is a structure that the composer often used to great effect. The work is dedicated to Sir Thomas Armstrong who at that time was organist at Christ Church Cathedral in Oxford. My soul is athirst for God, yea even for the living God. Howells spent the bulk of his career teaching in London, at his alma mater the Royal College of Music and as Professor of Music at London University. Early in 1941 he wrote a set of Four Anthems (originally titled ‘in the time of war’) on psalm texts, of which two have attained enduring popularity, O pray for the peace of Jerusalem and (third in the set) Like as the hart, the text of which is the opening verses of Psalm 42. The modal and jazz- and blues-influenced language of the piece creates an atmosphere of longing and even melancholy that emphasises the yearning of the text and the bitterness of its central section (‘My tears have been my meat day and night …’). before the presence of God? Gloucester Cathedral played an important part in the musical origins of both Gurney and Howells. They studied with Herbert Brewer, and from late 1907 were allowed use of the organ to try out their works ‘in the midst of Gloucester’s imperturbable Norman pillars’. 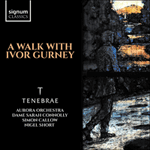 Gurney was also a former chorister in the cathedral choir, with a long involvement with the Three Choirs Festival, at which he had first encountered Elgar, who inspired him to become a composer. 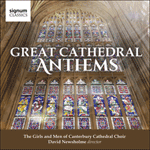 With his experience at Gloucester, and later associations with Westminster and Salisbury Cathedrals and St John’s College, Cambridge, Howells would go on to write many works for choir and organ. In early 1941, during the Second World War, he composed a set of six anthems ‘in time of war’, five of which were written on successive days. Like as the hart desireth the waterbrooks was composed in a single sitting on 8 January. Written in London, with air-raids a constant threat, whilst many men were engaged in fighting, and many were lost, the questioning cry of ‘where is now thy God?’ must have been close to the lips of many.